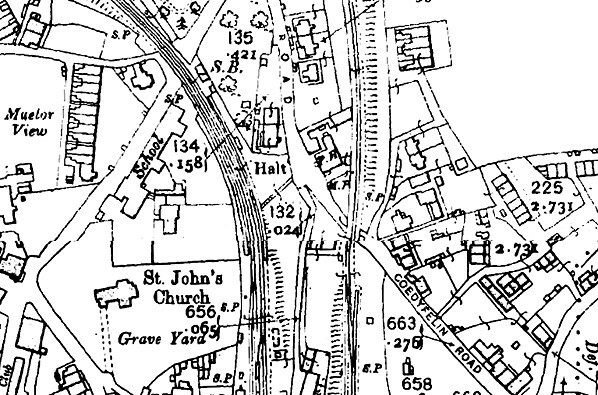 Location: South-east of the former level crossing on High Street, Brymbo, opposite the junction with Ty Rheilfordd. Notes: Brymbo West Crossing Halt was situated on the Wrexham & Minera Railway which, in its original form, ran from a junction with the Chester & Shrewsbury line north of Wrexham called Wheatsheaf to a limeworks at Minera. The line opened in July 1847 and passed through the Moss Valley and Brymbo areas with their mines and ironworks. The line had two very steep rope-worked inclines and two tunnels between Wheatsheaf Junction and Brymbo which proved a hindrance once traffic levels built up. 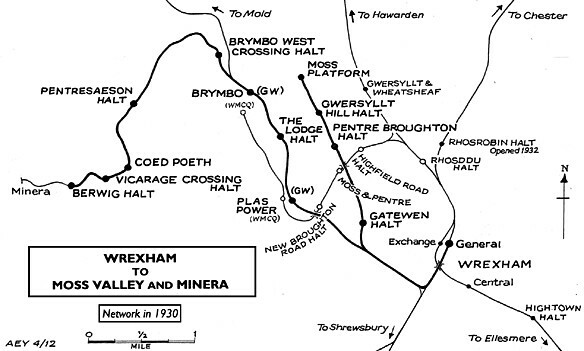 To solve the problem the Wrexham & Minera Railway (W&MR) company was incorporated on 17 May 1861 to build a three-mile line from the Chester & Shrewsbury Railway at Croes Newydd to the original Minera line at Brymbo. The line opened as a single-track branch on 22 May 1862 for goods services only, and it could be worked by locomotives throughout. The original line closed between Brymbo and Moss, but the rope-worked incline on the east side of the Moss valley remained in use until 1908. On 11 June 1866 the W&MR was amalgamated as the Wrexham & Minera Joint Railway with the Great Western Railway (GWR) and the London & North Western Railway (LNWR) as part of a plan to create a through route from Mold to Wrexham which opened on 27 January 1872. The sections of line that did not form part of this route, including the route between Brymbo and Minera, were vested solely with the GWR in 1871. The first attempt to introduce a passenger service onto the line had been in July 1866, but it failed as the line was deemed not to be up to passenger-carrying standards. The line between Croes Newydd and Brymbo became double-track on 1 April 1882, and on 24 May 1882 the GWR introduced a passenger service between Wrexham General and Brymbo. The service was extended to Coed Poeth on 15 November 1897. The double-track section of the Wrexham & Minera line continued to the north-west side of the west crossing before it became single, therefore the halt was provided with two platforms, constructed of timber. At the north-western end of the (Wrexham direction) platform adjacent to the level crossing was Brymbo West Crossing signal box, brick-based with a timber upper storey. The box controlled the crossing and the line through the halt. It was also the token exchange point for the single-line section onwards to Minera. Access to the up platform was via a path that ran directly in front of the signal box. Between the box and the platform ramp was a single-storey timber building that housed a ticket office and waiting room. On the down (Coed Poeth direction) platform there was a timber waiting shelter located at the mid point of the platform. A short distance to the south of the halt was Brymbo Middle signal box; located on the west side of the line it controlled another level crossing, to its south, and two junctions. The first junction was on the north side of the crossing and was the point where the Wrexham & Minera Joint Railway from Mold joined the Wrexham & Minera line. On the south side of the crossing was the junction between the main line and the GWR Vron Colliery Branch which passed through, and served, Brymbo steelworks. The line through Brymbo West Crossing Halt was extremely busy with goods trains, many of which had to reverse to enter or leave the Vron branch. Passenger services to Brymbo West Crossing Halt at the time of opening consisted of six railmotors that ran from Wrexham General to Coed Poeth on weekdays, and six ran back to Wrexham. After 1 May 1905 the railmotors were extended to run further west to Berwig Halt. On Saturdays the service was increased to fifteen trains. Often railmotors had to be replaced with a locomotive and coaches on Saturday afternoons as demand was so heavy. The railmotor took 20 minutes to reach Wrexham General from Brymbo, a distance of three miles. In the 1920s a halt attendant was provided during the middle period of the day, but at other times it was the duty of the signalman to attend to passenger trains. The July 1922 Bradshaw shows Brymbo West Crossing Halt as having weekday departures for Berwig Halt at 7:46am, 9:53am, 2:16pm and at 3:33pm. To Coed Poeth only there were departures at 12:31pm, 4:58pm, 6:03pm, 7:06pm and 9:10pm. There were also two services from Wrexham that terminated at Brymbo West Crossing Halt. To Wrexham there were weekday departures at 8:33am, 8:52am, 10:39am, 11:59am, 1:21pm, 2:56pm, 4:13pm, 5:21pm, 6:27pm, 7:26pm, 8:31pm and at 9:39pm. On Saturdays afternoon timings were altered, and there was no Sunday service. Being one of the larger settlements on the line Brymbo West Crossing Halt enjoyed a good service. had been built to carry the products of local mines, quarries and steelworks, and without the passenger service it could concentrate entirely on this traffic. The line through Brymbo West Crossing Halt remained busy well into the second half of the twentieth century. The line to Mold closed as a through route on 1 January 1951. On 1 January 1972 the line from Brymbo West to Minera closed completely after rail traffic from the Minera limeworks had ceased. Trains running between Croes Newydd and the Brymbo steelworks continued to run to the site of Brymbo West Crossing Halt to perform a reverse. This traffic seemed to be secure, but a national strike by steel workers began on 1 January 1980. The Brymbo works was not part of the nationalised British Steel and it continued to work normally, but the railway workers, decided to support their striking colleagues at British Steel. They ‘blacked’ traffic from Brymbo for a period of two weeks, during which time the works used road transport, much of it did not return to the railway. By 1981 all that remained was a daily trip that brought out finished products. By 1982 there were only three trains per week running. The last train ran on 29 September 1982. The line between Croes Newydd and Brymbo West closed completely on 1 October 1982. Track remained in situ for a few years but was eventually lifted. The site of Brymbo West Crossing Halt was later developed with housing. In February 2011 a section of the signal box wall could still be seen. 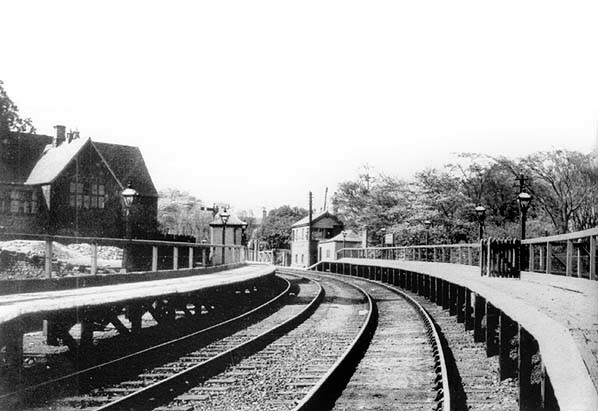 Brymbo West Crossing Halt, looking north in 1925. The halt was located in the centre of the village and was preferred by the inhabitants to Brymbo station which was both remote and at a much lower level than the village. 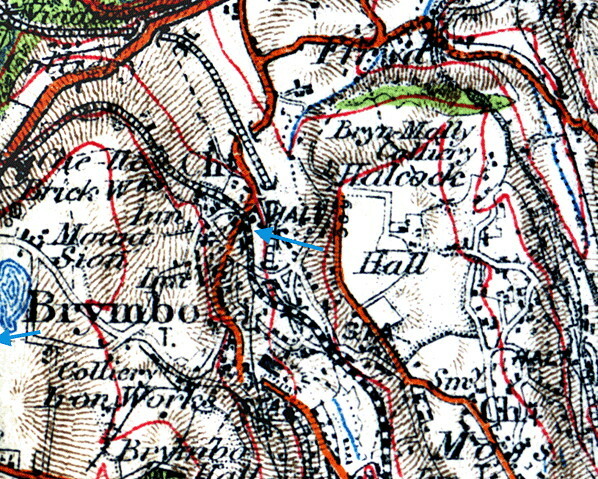 Brymbo West Halt shown on a 1912 map. Brymbo West Crossing Halt was named after the High Street level crossing that lay to the north. The crossing and the line between Brymbo Middle and onwards to Coed Poeth was controlled by Brymbo West Crossing signal box. 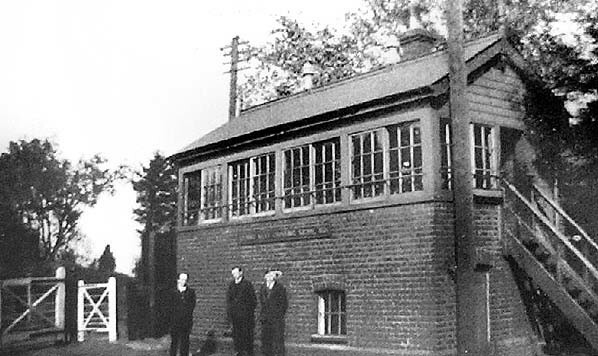 The box is shown in this 1950s picture. 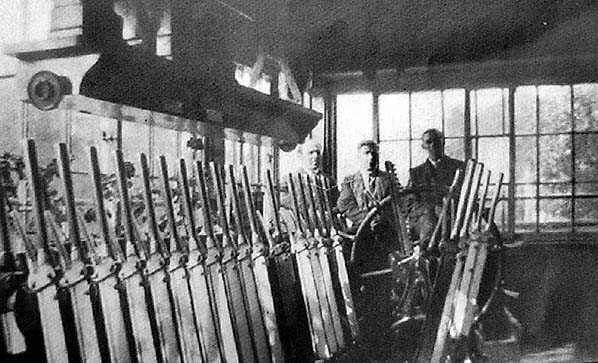 The inside of Brymbo West Crossing signal box in the 1950s. 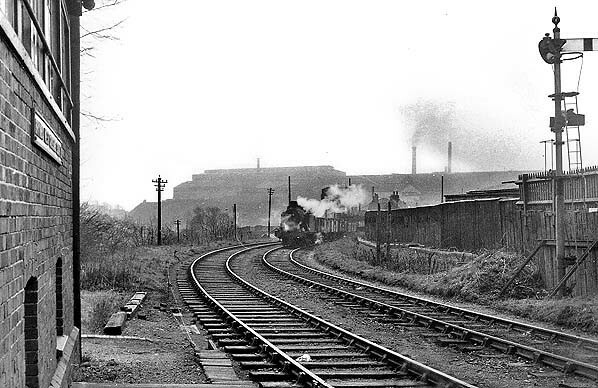 Looking south at the site of Brymbo West Crossing Halt in 1962. The halt appears to have left little trace, but closer observation shows two posts to the right of the line beyond the signal, which would have held the nameboard. On the skyline are the Brymbo steelworks which were reached by the Vron Branch. The train in the distance appears to be waiting to perform a reverse movement into the works. Looking south-east towards the site of Brymbo West Crossing Halt on 29 April 1967. In the distance can be seen Brymbo West Crossing signal box which was at the northern end of the halt. The event was a visit by the Wrexham, Mold & Connahs Quay Railway rail tour. 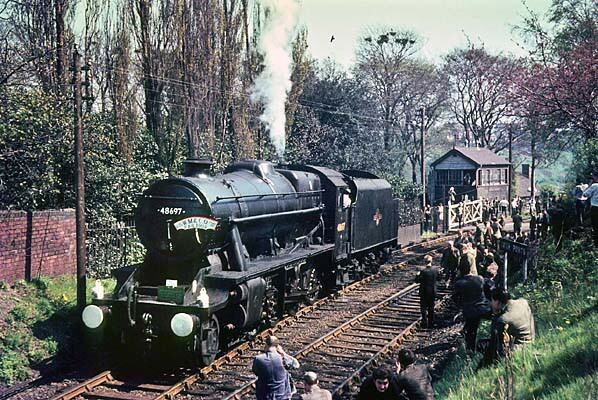 Former LMS class 8 locomotive number 48697 is seen running around its train which was beyond the crossing at the site of the halt. 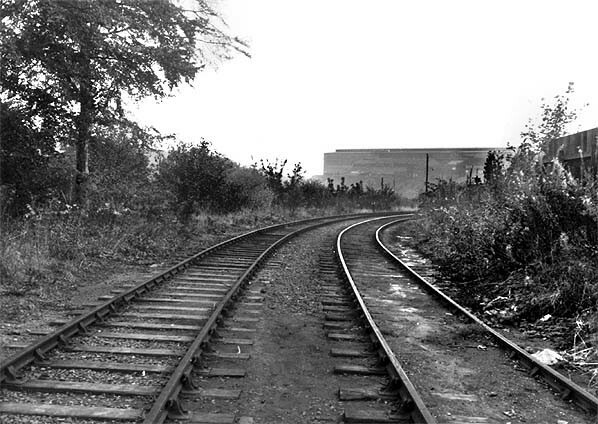 The site of Brymbo West Crossing Halt, looking south in October 1981. By this time the tracks continued only a short distance to the north, the line to Minera having closed almost ten years earlier. Brymbo steelworks, on the skyline, are towering over the village. Brymbo West Crossing Halt as seen in February 2011. 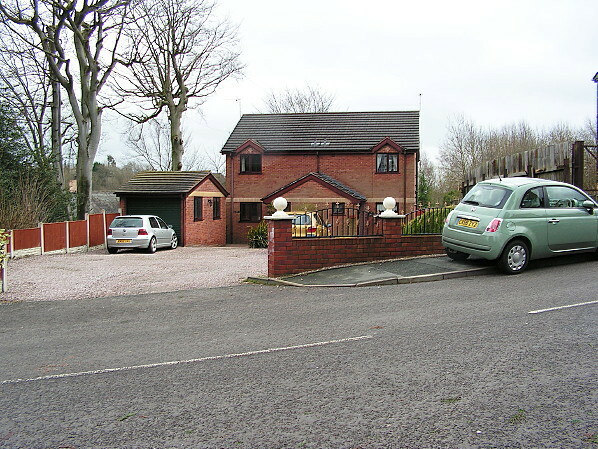 A house stands on the trackbed. The road in the foreground was the location of the level crossing. 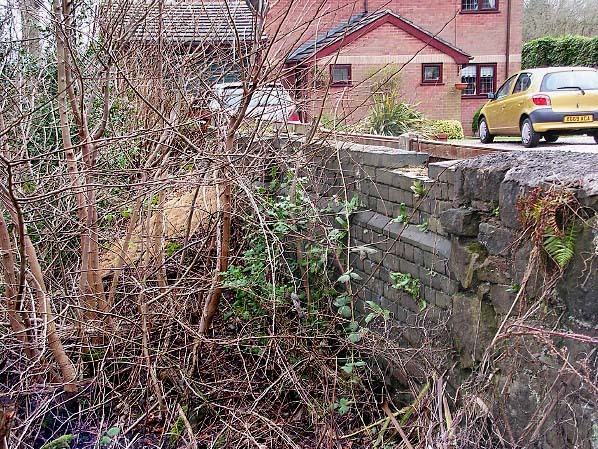 A section of wall from the Brymbo West Crossing signal box still survives in February 2011.